Good can come from something seemingly not so good. I have learned that lesson my whole life, and it played out again after ME was born. I have shared what happened the day ME was born, now I would like to share what happened after ME was born. It is really pretty incredible. After ME had open heart, I wanted to see the medical professional who shed tears on ME's birthday. When I called her office to talk to her, they told me she was no longer working at that office. My heart sank. I asked if I could have information about where she went, and I was told they could not give that to me. So each year on ME's birthday, I decided I would search for her. It became a yearly tradition of sorts. Every year, I would google her name. Most years I came up empty. One year, I found her! I was so excited. I could not decide if I should call or email. I decided that it would be best if I call her. I dialed the clinic's number. My heart was racing. I did not know what I was going to say, I just knew I wanted her to hear my voice, and tell her about ME. When I asked for her, after the receptionist picked up the phone, my voice was cracking from the nerves. I am not sure why I was nervous. I was very excited. She was such a kind person, and truly only shed tears because she hurt for us. So I should not have been nervous. But I was. The receptionist was very kind, but she told me that someone by that name was no longer at this practice. For all I know, it was a different person with the same name, but I was not even going to get to find that out. So again, each year, I continued my tradition of tracking her down. Surely I would find her. Once again, every year, I came up empty. When ME turned 7, I put a birthday photo of her on my Facebook page. I said something like, I wish the medical professional who cried could see her now. That statement ensued a conversation. My friends encouraged me to look for her again. I said I was done looking, and that I am closing that chapter in my book. My friends all came back with statements like, "Don't give up!" and "One more time!" After much encouragement, I decided I would try one more year. I googled her name. This time she did pop up! My heart raced again. I tried not to get my hopes up, just in case it was another dead end. My husband offered to take the kids to the movie, so I could get some stuff done to celebrate for ME's birthday. Instead, I typed out an email. I did not put ME's pic in it. I wanted to see if she would remember me first. I simply told her I had been looking for her, and I hope this is the right person by this name. I explained that she delivered ME, and I was just wanting to catch up. 45 minutes later, I heard a bing. I had an email. That was not uncommon, because my email binged a lot. I decided to take a break from birthday prepping, and I checked my email. It was a response from her! Now my heart was REALLY racing! She remembered us well! She said that she remembered that day very, very well. For you see, that was the day that she realized that she delivered the diagnosis in a way that was probably not best for the parents. She had spent the following years teaching other medical professionals how to deliver a diagnosis properly. She said she had felt bad how it all went down, and hoped that she did not ruin ME's birthday. She had never delivered a baby with Down syndrome. So it was very emotional for her. We emailed back and forth. I sent photos. It was absolutely incredible! So while I was helping new parents as they got their diagnosis, she was advocating for medical professionals to be careful how they deliver the news. Today, we are friends. In fact, that very sacred moment, puts her in my book, as one of the most significant people in my life. I am honored to call her my friend. We are Facebook friends as well. So now she gets to watch our sweet ME grow up! 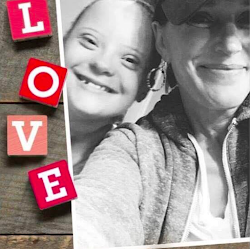 And when she delivers the diagnosis to a parent that their child has Down syndrome, she does not have to go far, to see the joyful journey our family is on. Telling the parents they will be fine, like my other doctor said to me, is something she can say, and smile saying it. Knowing that she is watching a little girl grow up right before her eyes, who taught her a very valuable, life changing lesson! I will never forget the day I found her. For me, it was like closing a chapter, and opening a new one! ** If you are a physician, or you would like to give information to your physician on how to deliver a diagnosis to new parents, check out this physician's guide at Down Syndrome Diagnosis Network and the National Down Syndrome Congress Physician's Guide. This entry was posted on Tuesday, February 10, 2015. You can follow any responses to this entry through the RSS 2.0. You can leave a response.